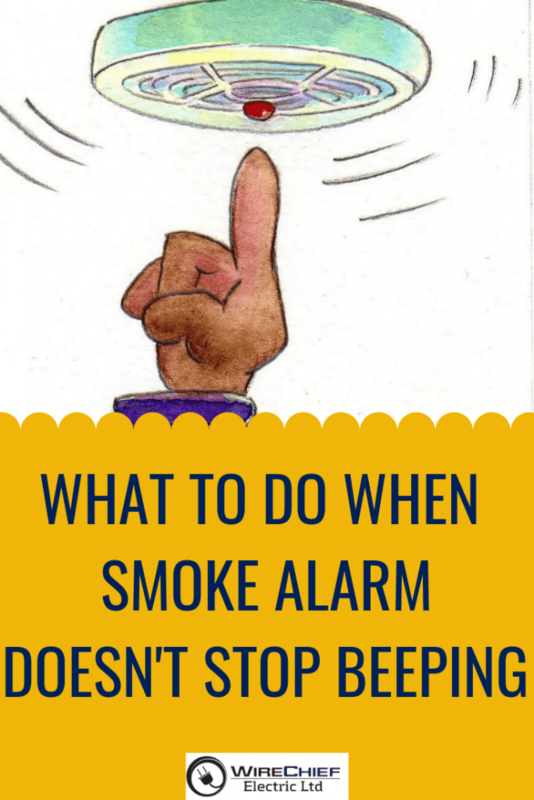 What to Do When Smoke Alarm Keeps Beeping? 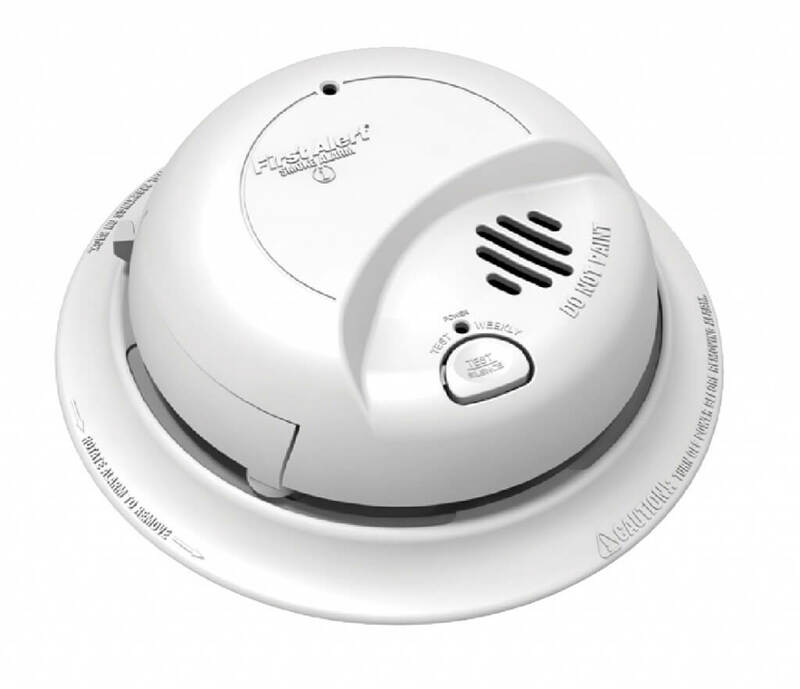 Smoke detectors are intended to make a chirping noise once the battery needs changing. Newer smoke alarms keep some errors in the processor. The smoke alarm must clear errors after the battery is changed, but it might continue to chirp even after you change the batteries. This usually occurs in electrical powered smoke alarms with a battery backup. When this happens, the way to stop the chirping noise is to reset the smoke alarm to manually clear the error from the processor. Why do smoke alarms chirp intermittently? The “chirp” is usually caused by issues related with the battery or miss-wiring. However, don’t confuse the chirp with an intermittent alarm. A “chirp” sounds like a higher pitched tone and sound in equal intervals about once every minute. An intermittent alarm is usually a random sound for several seconds and has a lower pitched tone. The battery pull-tab should be removed after AC power is provided to the device. The battery drawer should be totally closed for the battery to make contact with the terminals. 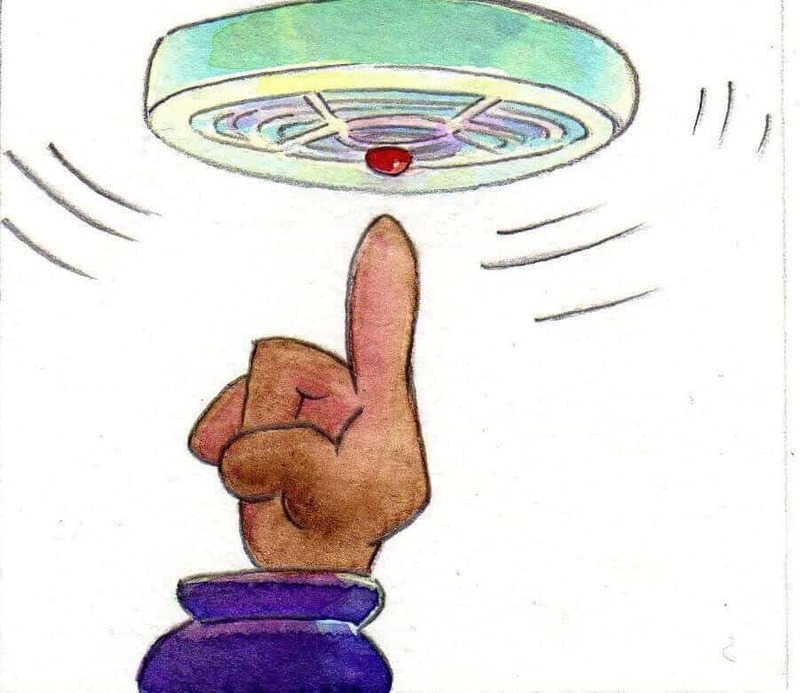 As the battery in a smoke alarm gets weak, the smoke alarm will “chirp” about once a minute to let you know that the battery needs to be replaced. Note: Only the device with a low battery will chirp. The other interconnected alarms should be silent. The battery may not be completely making contact with the terminals in the alarm. Check to ensure the battery pull-tab or any other obstruction is completely removed. Security systems, monitors, carbon monoxide alarms, and other devices have a comparable low battery or alert sounds. Other reason for a smoke alarm beeping or chirping erratically could be temperature fluctuations in the house. If you set the thermostat at an unusual very high or low temperature, the smoke alarm detects this and issue a sounding alert. Another reason why the smoke alarm chirps could be if it detects hot air coming from the kitchen or bathroom. This could happen when you are cooking at high heat or someone opens the bathroom door soon after taking a hot shower. To avoid this kind of false alarms it is best to either move the smoke alarms in close proximity to the kitchen or bathroom door or use another means to ensure that the hot air does not reach the alarm vents. Another reason for a smoke alarm beeping is that it has reached the end of its lifetime. Smoke alarms usually last for between eight and ten years. Take the smoke alarm off and check the date of manufacturing on the back. If it is more than eight years old, you would need to replace the smoke alarm as soon as possible. Why do I hear the smoke alarm “low battery chirp” if the battery is new? Does your smoke alarm have a separate silence push button? If so, the button could have been pressed by accident. The alarm will then “chirp” once every minute for up to 15 minutes. Make sure it’s the smoke alarm. Other devices have comparable low battery chirps or warning sounds. The reason of a single chirp is often hard to pinpoint. Check devices like carbon monoxides alarms in use. Sometimes “new” batteries may not be fresh. If batteries are kept in cold areas they can lose their charge more quickly. Be sure to check the freshness date listed on the package when purchasing new batteries. Why does my smoke detector go off when I install a new battery or turn on the AC power? There may not be sufficient battery power. Try another battery. Problems with voltage or not enough electrical power (brownout) may cause a constant weak sounding alarm. For hardwired alarms, momentarily disconnect power at the service panel until the brownout is over. Incompatible warning device. If an incompatible alarm or secondary device is connected into a series of hardwired smoke alarms it could cause the system inadvertently go off. How to Reset a Smoke Detector to Stop Chirping after Installing a New Battery? Shut off the main breaker in your home’s breaker box to turn off the electrical current running to the smoke detector. Take the smoke detector off its mounting bracket on the ceiling and disconnect the power cable plugged to the smoke detector. Take out its battery, then press the “Test” button holding it down for 15 seconds. An alarm will sound for a short time, then the alarm will silence. Install the battery in the smoke detector, reconnect the power cable and mount the smoke detector back on its mounting bracket. Turn the breaker on. The smoke alarm will chirp one time to indicate power was restored to the unit. Remove the battery out of the smoke detector. Press the “Test” button holing it down for 15 seconds. An alarm will sound for a short time then the alarm will stop. Install the battery back in the smoke detector. The smoke alarm will chirp once to indicate the battery is connected. A smoke alarm is necessary to ensure that you and your family are alerted in case of a fire at home. Since this is an indispensable means of protection, make sure that your home has an adequate number of smoke alarms installed. This will depend on the size of your house. You can call WireChief Electric and a skilled electrician can provide you with advice on the best locations for smoke alarms in your house. A professional Vancouver electrician will help you install the smoke alarms properly and ensure that they do not chirp unnecessarily. A correctly installed and working smoke alarm can save lives and properties by alerting you to the risk of a fire. If you need a Reliable, Professional & Friendly Residential Electrician, Commercial Electrician, Electrical Contractor in Greater Vancouver contact WireChief Electric, we offer creative but practical electrical solutions.